Newton North High School was the overall winner of the 2015 Mass. Envirothon. BELCHERTOWN, Mass. (May 15, 2015) – A school year of preparation paid off for local teenagers who were rewarded for their knowledge of the environment at the 28th annual Massachusetts Envirothon. 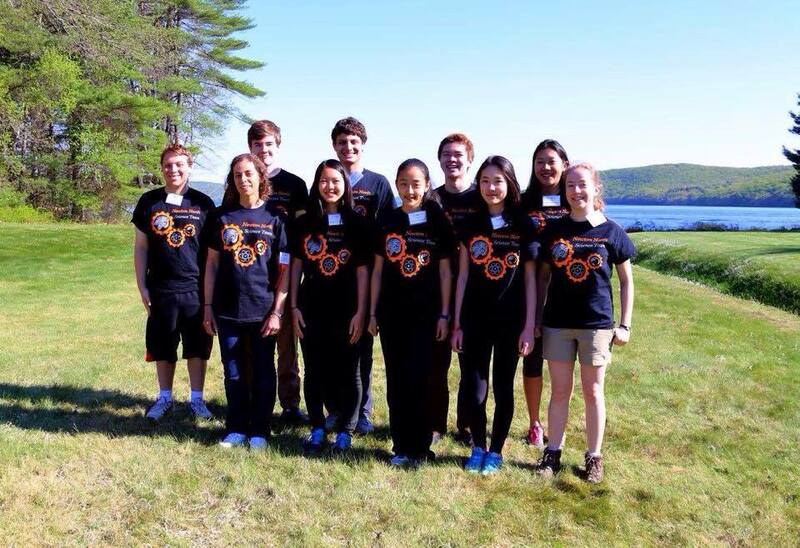 They were among more than 250 high school students from 30 Massachusetts communities from Boston to the Berkshires who descended on the Quabbin Reservoir on Thursday, May 14th for the outdoor field competition. At the fifth station, the Current Issue, each team gave a 15 minute presentation on “Climate Crisis: Taking Action in Massachusetts Communities” to a panel of judges. Teams researched the Current Issue in their own community in preparation for their presentation. Judges included environmental professionals from government agencies, non-profit organizations, academia and private industry. Teams were asked to assess the effects of climate change in their community and to recommend steps that their city or town and individuals, including young people, should take to address the issue. “The Envirothon is more than just a competition about environmental knowledge. It’s a gathering of the environmental community of Massachusetts. It aims to prepare the next generation for the stewardship work that needs to be done,” said Snyder. The 2015 Massachusetts Envirothon was made possible through the contributions of partnering agencies and organizations, including financial support from the U.S. Forest Service; the Massachusetts Grange; Environmental Business Council of New England; and local conservation districts. Fifteen federal and state environmental agencies, conservation districts, non-profit organizations, higher educational institutions, and businesses provide expertise and help organize the event. Dozens of volunteers were on hand on May 14th to handle all the event logistics from setting up tents, tables and chairs, checking-in teams, serving food, scoring tests and cleaning up. For more information on the Massachusetts Envirothon visit http://www.maenvirothon.org. This is the new Massachusetts Envirothon website. We hope you find it easy to use. Please bear with us as we add content and make improvements. Comments are always welcome.